This is the only known image we have of the SS Mendi, the ship at the centre of South Africa’s worst military disaster and biggest single loss of South African life at war (a little more than at Delville Wood – and that’s quite staggering). On 21 February 1917, during World War I, this chartered troopship – the SS Mendi – containing a full battalion of South African Native Labour Corps men and officers on it’s way to the western front was rammed in fog conditions in the English Channel. 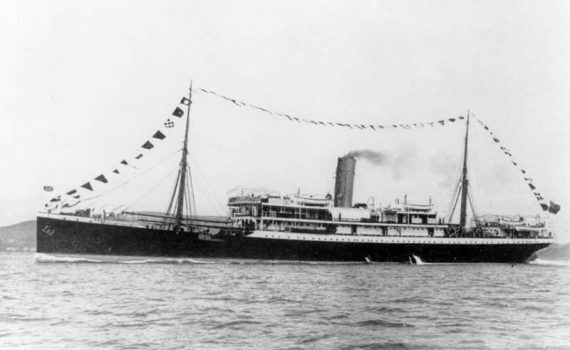 The SS Mendi sank in 20 minutes. 616 South Africans (607 of them black troops – mostly from rural areas around the Eastern Cape) plus thirty crew members, mostly British, died in the disaster. 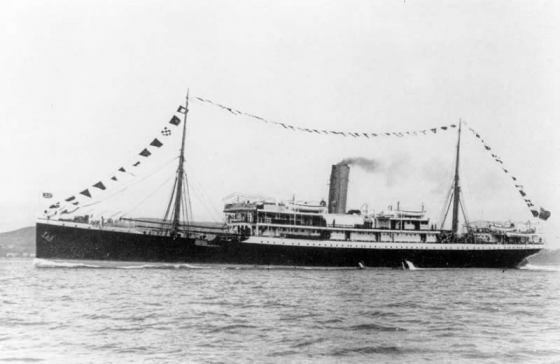 The much heavier ship, the SS Darro, which rammed the Mendi had not been following safety protocols for sailing in fog conditions, and furthermore did not stop to rescue the men in the frigid February water. for example none of the black servicemen on the SS Mendi (neither the survivors nor the dead), received medals, nor any other members of the South African Native Labour Corps, although their white officers were decorated as a consequence of a South African Government decision. Monuments were not really erected to these men and their legacy was in effect scrubbed from South African history. Except for a small unknown memorial in Port Elizabeth, little was done in South Africa until a proper and fitting memorial was finally unveiled at Avalon cemetery Soweto by Queen Elizabeth II in 1995. So much so was history shielded and altered that most people in South Africa still to this day do not know (or believe) that in World War One (and World War Two for that matter) – approximately 40% of the standing South African Union Defence Force – where “non-white” South Africans. 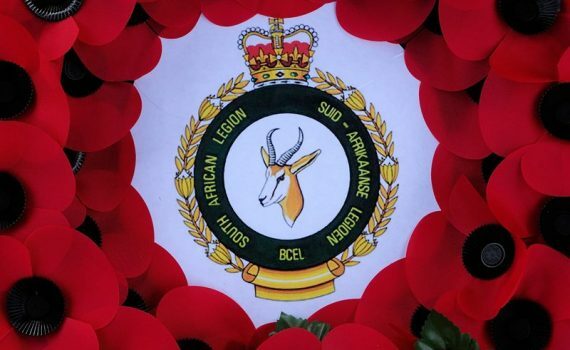 The injustice to these men – lost valour – is something the South African Legion is working very hard to redress with annual commemorations to the disaster – both in South Africa and in the United Kingdom in February. To give perspective on the scale of the disaster and the loss of life and the impact to the black South African community at the time, page down through the honour roll of the South Africans who lost their lives that day, it’s quite staggering. Lest we forget. 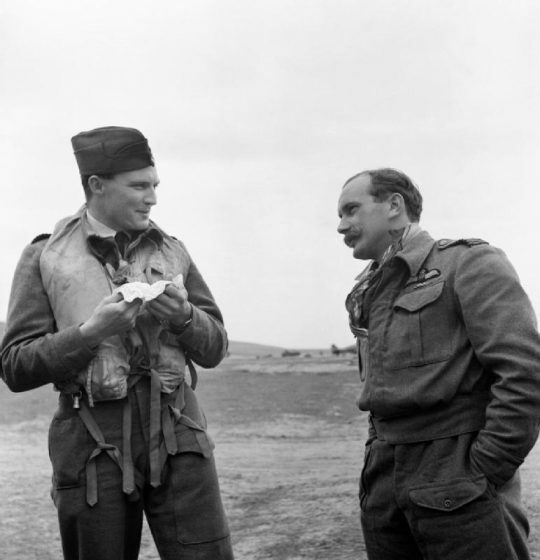 Group Captain P H “Dutch” Hugo (left), Commanding Officer of No. 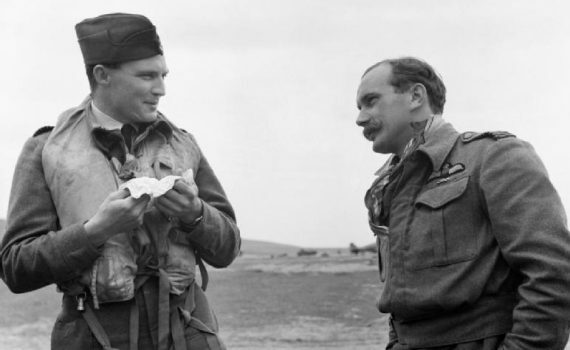 322 Wing RAF, and Wing Commander R “Raz” Berry (right), who took over leadership of the Wing in January 1943, conversing at Tingley, Algeria. Petrus Hendrik Hugo, a South African, joined the Royal Air Force on a short-service commission in February 1939. He flew with No. 615 Squadron RAF during the Battle of France and the Battle of Britain, and became a flight commander in September 1941. He was posted to command No. 41 Squadron RAF in November 1941, and then took over the leadership of the Tangmere Wing in April 1942 but was shot down (for a second time) and wounded shortly after. On recovery Hugo became Wing Leader at Hornchurch, but was soon posted to lead No. 322 Wing in the forthcoming invasion of North Africa (Operation TORCH). He took command of the Wing in November 1942 and added significantly to his victory score over Algeria and Tunisia. From March to June 1943, Hugo served on the staff at HQ North-West African Coastal Air Force, but returned to command 322 Wing in Malta, Sicily, France and Italy until it disbanded in November 1944. Having achieved 17 confirmed and 3 shared victories, he then joined the staff HQ Mediterranean Allied Air Forces and finished the war flying with the Central Fighter Establishment.